Seven ValvTechnologies' employees recently completed the rigorous National Board process of becoming an ASME Code Section I, Pressure Relief Devices (V) Certified Individuals. ValvTechnologies, Inc., manufacturer of zero-leakage severe service isolation valve solutions, is pleased to announce that seven employees have received their AMSE Code Section I, Pressure Relief Devices (V) Certified Individual quality certifications. ASME’s Boiler and Pressure Vessel Code (BPVC) have pioneered modern standards development, maintaining a commitment to enhance public safety and technological advancement to meet the needs of a changing world. The BPVC have long been considered essential within such industries as power-generation, petrochemical and transportation among others. This October, seven ValvTechnologies’ employees completed the rigorous National Board process of becoming an ASME Code Section I, Pressure Relief Devices (V) Certified Individuals. 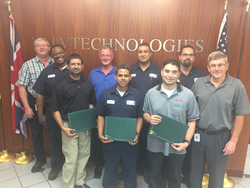 Congratulations to QA Engineering Manager Suresh Balachandran, Supplier Quality Assurance Manager Harry Marks, Inspector Reginald McGee, Quality Inspector David Hernandez, CMM Programmer James Stark, Inspector Rene Monreal and Service Inspector David Garcia for completing training and testing under the jurisdiction of the National Board of Boiler and Pressure Vessel Inspectors. Founded in 1987 and headquartered in Houston, Texas, ValvTechnologies is the leading manufacturer of zero-leakage, severe service isolation valve solutions. Employing more than 500 people worldwide, our offices are located in the United Kingdom, Mainland Europe, China, Middle East, India, Australia and South America. In addition, ValvTechnologies partners with stocking distributors and independent representatives to service customers around the world. To find out more about the products and services offered or to locate a representative, visit our website at http://www.valv.com. ValvTechnologies has a world-wide reputation for superior quality and dependability with customers in every industry. From standard applications to the most sophisticated, ValvTechnologies continues to provide solutions to manage severe service processes around the world. What differentiates ValvTechnologies is their focus on helping clients meet challenges safely and efficiently. Whether those challenges are daily process problems that have to be met one valve at a time or system-wide concerns demanding total flow control solutions, ValvTechnologies has the solution. By equipping the best people with the latest in technological design and manufacturing processes, ValvTechnologies has created an atmosphere where quality and dependability are built into their products from start to finish. By focusing on this People-Process-Performance principle, ValvTechnologies has become an integral part of their customers’ asset management strategy and a key contributor to everyday process efficiency. ValvTechnologies uses international quality standards to assure that they conform to specified requirements throughout their total process. These requirements include design, development, order processing, production, purchasing, quality control, installation and service. Our own processes are based on the requirements of ISO 9001, API Q1 and PED. For more information visit http://www.valv.com.